According to the RvB ethos, they are a collection of casual pilots wanting to have fun. Anyone can join and take part in the constant explosions, blowing up each other, war targets and nullsec roam targets. 8176 individual RvB pilots were listed on the kills as killers or victims. They all flied under RvB colors at the time of the kill report. It's awesome isn't it?! Thousands of players learned and enjoyed EVE PvP. Yay! I gained almost complete copies of kills. You can check the data yourself: Red kills, Blue kills, Red losses, Blue losses. 212966 kills and 204844 losses were found which are API verified and not duplicates between the two alliances. Something was wrong in February, as unusually low amount of kills were listed on Zkillboard. The data lists all player killers with their damage contribution to the kill (no killers = NPC kill). 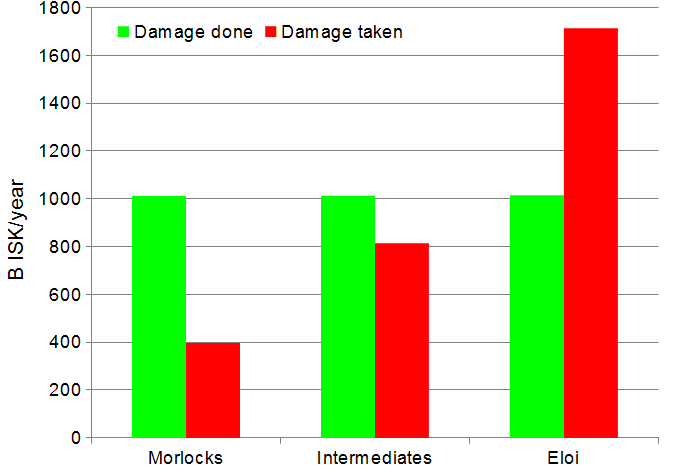 The kills are distributed among killers by damage. If someone did 0.1% damage on a 100B titan, he is credited with 100M kill and not 100B. This way kill whoring is excluded. The data is from 2013, there was no GRR project back then. 1935 pilots had less than 1 million ISK kill, many of them didn't even get on a single kill. They had losses though, 83.6B. RvB is the surreal world of "time machine". It contains two species: the Eloi are wide eyed, nice, naive, while the Morlocks are cannibal brutes eating Eloi. In RvB there is also an intermediate group, who are in the process of evolving into Morlocks. 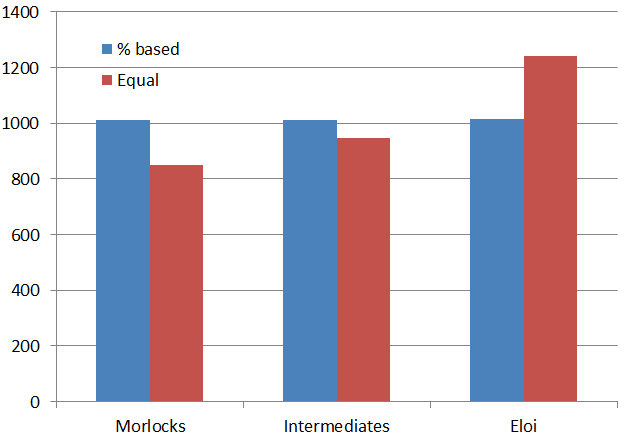 The Morlock-RvB is a typical "elite PvP" alliance according to size, acivity, ISK ratio. The great trick is that they don't need to wardec others or go to a roam to get kills. Their recruiters channel endless streams of genuine newbies, literally to their staging system to serve as food for the Morlocks. Also, if the enemy docks up, they just dissolve the purple fleet into red and blue and feast on Eloi flesh, right where they are! As you can see, the 96% Eloi are barely visible, showing very low activity and/or very high player rotation. Even the intermediates (who are in the top 4%) have worse statistics than the Lemmings, since Lemmings are fed with dumb nulseccers who shouldn't be in highsec anyway. As you can see, only the Morlocks gain from outside wars and roams. 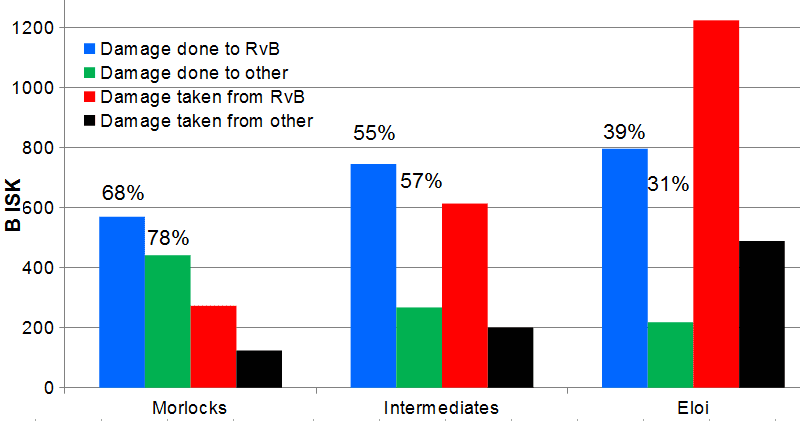 The intermediates are neutral (the outside targets are as good for them as RvB targets), while the 96% Eloi would be much better off if RvB would be ... Red versus Blue. 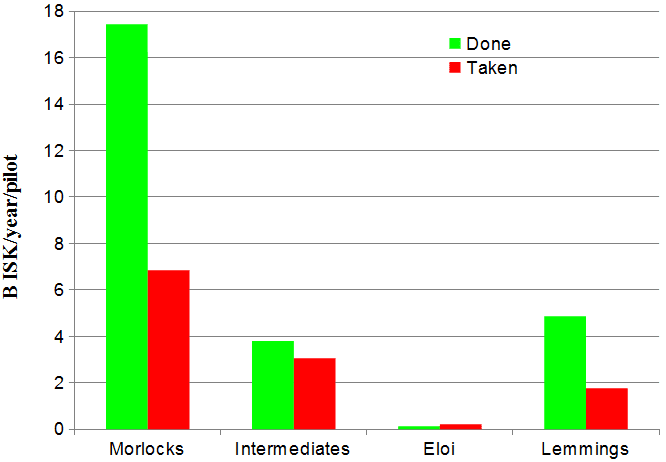 Eloi barely kill any outsiders, but receive most of the outsider damage. This is obvious from the fact that Red versus Blue action is regulated with rules that protect the weaker, while a real war is all out. So if the RvB leadership would care about the interests of the 96% of their members instead of the interest of the 0.7%, RvB would do its declared activity instead of wars and roams. Of course the above statement is upside down. The wars aren't there to entertain the Morlocks, the wars are the very purpose of RvB. RvB was created to fight these wars, the Red versus Blue action is just there to entertain Morlocks in the downtime. The Morlocks are practically mercenaries for the Goons, paid in newbie blood. Finally, let's address the Joker social counter-argument: "they are having fun while being farmed". If someone is having fun in RvB, he surely stays in RvB and logs in frequently, to keep having fun. So I checked how many different days the RvB pilots had killboard activity (getting on kills or being killed): As you can see, vast majority of the members had enough "fun" after a few days, so RvB must be just as wonderful place as the directors and the Morlock forum posters claim. Considering that RvB currently has about 7000 members, they either have awful lot of inactives, or recruit new victims very fast to replace the quitters. I'm afraid, many genuine newbies were scammed into RvB and quit the game because of all the "fun" they had! If your name is not in the table above, you should leave RvB immediately, as you are kept there only as food! Join Lemmings and get your revenge! If you are a war enemy of RvB, you should add these pilots as personal red contacts, dock up if several enter the system, or primary them in fleet engagement. The rest of RvB is harmless and you are free to farm them. Don't forget to mention the link to this post in local for the poor Eloi! Personal comment: how did I get this weird idea to do a pilot-level analysis on RvB? Because RvB directors kept bugging me to join RvB on an alt, to get first hand experience. If someone doesn't give you answers, but tells you to "get personal experience", he means "I don't want to say loud what is going on here, but you'd like it". They knew from my ganking project that it wouldn't be a problem for me to get into the Morlocks. So if I'd join, I'd probably enjoy ganking wide eyed newbies. They hoped that it will seduce me and I stop attacking their masters. Funny kills by the GRR project: Pod, Renter, highsec slave, dumb hauler, you can't rat in Jita, an Eloi, I'm afraid. I missed this from yesterday. The Goons killed their own POCO to avoid us killing it. Finally, the last Goon POCO in highsec. Goodbye Banani, your schoolyard bullies won't be missed here! Man, I didn't make your list. That's upsetting, I must do better. I call on any RvB member not on that list to try and join it, we should all strive to become better PvPers. The methodology is almost sound. However, most of those newbie cannon fodder actually are contributing more than lossmails, by filling the important role of "hero tackle", and more importantly, are kept well stocked with fitted ships at rock bottom prices, and with free frigate hulls for the asking. The hard skills of a month old character limit their DPS considerably, which means their contributions are underreported and dismissed as killwhoring by your methods. They may not contribute much DPS to those killmails, but without newbie hero tackles, there would be a lot fewer of those big shiny killmails to whore on. I really like flying in rvb but this post is totally accurate. There's a small elite group of people who fly around killing t1 newbies in their imperial navy slicers with lg snakes. RvB is a place for veterans with alternate income streams and lots of disposable income, it's a terrible place for newbies to go. Of course the rest whores on mails. That's 95% of pvp in Eve. You'd know that if you actually PvPed. Numbers are fun, but numbers fail to tell you the why. I was seriously hoping for something interesting when you last posted about dirty secrets. The problem is that you will always have a gap between the skilled and newbies. Between those who care about being competent and those who are in it for the 'lolz'. Could it actually be a breeding ground for cannon fodder? Perhaps. But the simpler explanation is that you have a bunch of people who like PvP in Red v Blue and consequently don't leave the group. Individually, there may be a number of people who are merely alts of experienced players and this is their PvP outlet. I used to have an alt in RvB for High Sec PvP fun and he had a good KDR. Again, since the most likely explanation is the simplest: a lot of new players join RvB to jump into PvP wihtout the fuss of Low Sec or Null Sec. As such, they are clueless and die quickly - while having fun at the same time. Also, not all inventations to join something are to get you sucker you into becoming a... morlock, but simply so you get first hand experience. Why tell you how great something is when you can experience it for yourself... try before you buy... or perhaps try before you flame. I think you also have to consider the value of *loss* to a player - as in the teaching experience it provides. I learn a lot more from a loss in PvP than from a victory. I disagree with anonymous above - it's true that there are veteran players who roam around looking for solo kills, but newbies just have to join a fleet to gain the protection of numbers. @Telemachus Rheade: Goons barely fly solo, still their members have kills. The thing is that non-solo RvB just files around and gets a cruiser or two over an hour. No doubt their damage done is a joke. @Petri: if they have so much fun, why don't they stay? @LR: and where is the "protection of the fleet" when these newbies are massacred? Goonwaffe Goons have the protection of the fleet and their damage:loss is near 1:1. Of course Goons usually don't farm their own newbies. That last graph is the most interesting, and nothing the spinning RvB commenters can say discounts it. 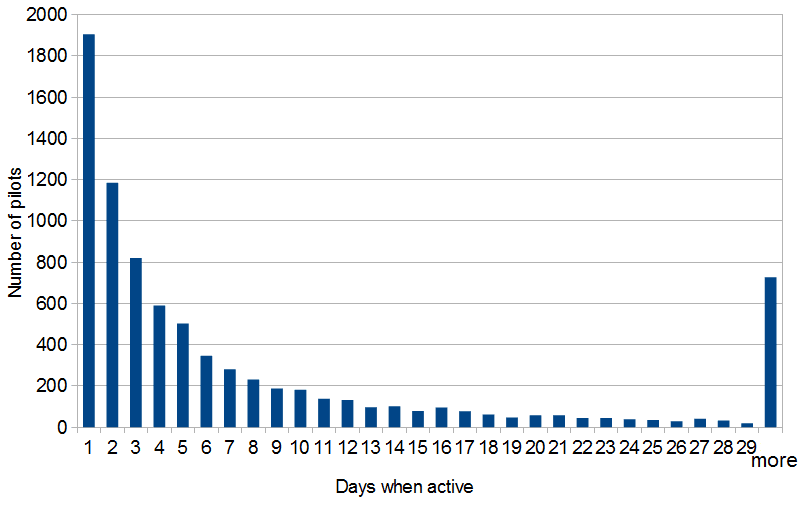 Only a fraction of RvB players stay active more than a short while. They either leave or stop logging into their RvB character. So everyone starts off as a moron but the ones that play for a bit longer get the most out of a support network and start to get better results. Sorry, I don't see anything earthshattering in this. Of course full time PvP pros that play every day will have a better dealt/taken ratio to the new ones, and you'd need 100 new players get close to the total damage done over a year because they are more active. @dobablo: that's kind of obvious. However RvB lived on the idea of being different, while in fact it's just another "Elite PvP" bunch, with the specialty of scamming newbies into themselves, practically for awoxing. Does your numbers also take into consideration logistics players? I've been in quite a lot of fights, where I have 0% contribution to the damage done to the target, due to being a logi-pilot, with no offensive capabilities. Gevlon, you use "true damage" as measure for most of your analyses (and not only this post), but you only address damage dealers who are half of a fleet at most. Tacklers, Dictors/HIC, logistics, electronic attack ships... they don't do damage, but are the core of the fleet even if you barely see the on any KB (especially true logis). As an example, you can check my KB (https://zkillboard.com/character/1978674202/) which is quite bad, but you don't see those dozens of kills I were involved in my scimitar. Thus, saying that "1% on a 10B ship = 100M real points" is not really better than normal KB (it does prevent kill sharing on several KB however). Keep it in mind in your reflection. For RvB, your numbers are quite interesting and represent the reality: there is an elite with better skills (in both terms) who have a higher ratio (from far). But I'm sure you can see the same pattern in most alliances, especially those who are PvP noob-friendly. Same apply in other games btw: when you start PvPing, you lose a lot before you begin to win more and more (except LoL, where you keep loosing and winning without any logic #troll). I do not say that they are independents (especially from Goons), but you are not forced to shoot Custom Offices and you can keep on killing Reds/blues and having fun even if you lose lots of ships. so, basically you proved that rvb has alot of inactives. yea, we know, easily 85-90% of the chars in rvb are inactives. instead of all these fancy graphs you could have simply looked at the members page of the corp ui to find that out. You were also trying to make the point that there's a large amount of people that join rvb, die a few times and quit..... yea that's pretty much public knowledge, rvb is a sink or swim environment, it isn't e-uni's hand holding style of learning, its the in-your-face-dieing-in-a-fire style of learning. 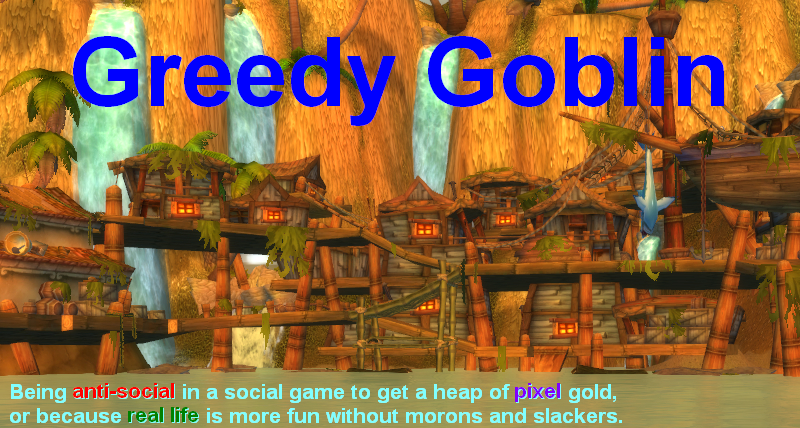 We do have programs and incentives in place to help newbies out, but all rvbers are expected to to fund their pvp habit and use a minimum of brain power to look up stuff on the internet and ask questions whenever they need to. This lassie-faire style of education creates independent, resourceful and knowledgeable players. This style isnt for everybody,hence people quitting after a short period of time. You act as if we hide this fact from newbies that sign-up. Evidently you dont hang out in our channel very much. pretty much all people that ask about joining are immediately informed that they will need to be financially independent, and that the learning structure in rvb is of the learn as you do variety, ie: minimal hand-holding, alot of helpful nudging. nice analytics just the same gelvon, you have a knack for cheery picking your facts to make you're point look valid. Anyways this whole grr thing was clearly an attempt to bring attention to your blog, and you've succeeded, I'm thoroughly entertained. As one of the inactive majority (in terms of weekday PvP and in-corp kills) I don't think you analysis of the "tail" is right. For me its quick access to a variety of PvP experiences for an alt. If I move on I'll most likely leave a 30-day buddy trained alt in corp for a quick fix. Although I know you've disowned the Lemmings now, I wondered what a similar look at their particpation over time would show. @Ryanis: I made a new calculation, check update on the bottom of the text. As you can see, it doesn't make much difference. @Catalyst: inactives have no losses. Also, I do claim you don't inform your newbies. Informed newbies either don't join or stay for longer. Considering that half of your newbies leaves in 3 days, it's safe to say that they expected something else. @Calintor: similar look on Lemmings is impossible, due to lack of year to analyze. Shorter timeframes give larger imbalances. But I'll cook something up. Do RvB rules protect eloi from massacre or morlocks from blobbing, primarying, and other unfair tactics? Despite being a very noobish pvp'er and having a terrible kill / death ratio I have managed to get positive true isk efficiency in BNI by doing 5 to 10 per cent of the damage in a few dictor and hac kills. "Considering that half of your newbies leaves in 3 days, it's safe to say that they expected something else." Well, such churn rates are quite common in the industry whenever you provide demos / free trials / free to play. While a part of it surely unsatisfied expectations, another large part is that people try out free stuff even if they suspect they won't like it. So instead of looking for "RvB's problem", an equally valid explanation is that they make it so easy to join that even people who aren't really interested try it out. Btw, that includes me. My reason for joining with an alt - despite having no interest in PvP - is to get some hands-on experience in case I am attacked someday. @Gevlon - "why don't they stay". You would have to ask them. Clearly there are plenty of RvB members who stay in RvB - look at your Morlock list. For myself, I removed my alt because I was focusing on other aspects of the game and did not have time to maintain him. I recall seeing corp mails from RvB members stating they were leaving to earn isk and would be back. There are others who eventually leave and get into other corps. Statistics only tell you so much of the data. You have good statistics, but you don't have the reasons why the data shows the way it does. It helps sort out chaos... but tells yo unothing of why that chaos is really there. Note: I am not saying some of your Morlocks are not remaining in RvB because they are exactly that: Morlocks, but to attribute the motives of a few as the motive for the whole would be erroneous. Holy hell fire batman! It all seems so obvious now that you've pointed it out. And it does explain a lot and why I feel like I am cannon fodder most of the time. I never realised there was this split but now that I know I am a Eloi I see it clearly. Deep down I knew I wasn't one of the elite, but at least know I know why. So what does it tell us about the modern capitalist society? The real world has its own Morlocks/Eloi disparity. IRL Morlocks hold a disproportionate amount of world's wealth, power and influence, leaving billions of IRL Eloi to fight over the remaining scraps and die for the amusement of their masters. RvB Morlocks hide their predatory nature behind propaganda of casual fun and good fights. IRL Morlocks hide their predatory nature behind propaganda of meritocratic society and equal opportunity for all. RvB Morlocks reap profits from agreements with Goons while RvB Eloi pay the blood price. IRL Morlocks reap profits from lobbying policy changes that IRL Eloi bear the economic brunt of. Against RvB Morlocks, the proposed solution is to join the Lemmings. Against IRL Morlocks, the proposed solution is to ...?? ?